Nyala Wonder Travel welcomes you on board an exciting trip to see picturesque villages perched on rocky crags, pretty pastel houses reflected in the stunning blue sea, and much more. This trip to the Ligurian Riviera and the Côte d’Azur includes in the tour package overnight accommodation in hotels of great charm and elegance. Let us take you on a romantic journey: prepare yourself to be enchanted by scenery filled with the brilliant colors and fascinating sights of the Ligurian Rivieras, both the Levante and the Ponente, and the nearby French Riviera. The attraction of this region is not limited to the coast as, just a short distance inland, you will find an area full of tradition, culture, nature and beautiful landscapes just waiting to be discovered. You will visit places like San Remo, Portofino, Cannes, all of which will amaze you with their beauty and their many attractions: you will be surrounded by a rainbow of colors and scents, in any season and at any time of the year. This will make it an unforgettable journey, filled with new experiences and new discoveries! Get ready for a tour that hugs the delightful seashore along the three most beautiful Rivieras of the Mediterranean: waiting for you are spectacular sunsets, endless scenic panoramas and historic centers filled with character and tradition. And, to begin your romantic journey, the famous bay of Portofino. Arrival in late afternoon in Rapallo / Santa Margherita Ligure for check-in to your hotel. Dinner and overnight stay. Today you will be taken to discover of one of the most precious jewels in the world: Portofino opens its gates with a symphony of scents and colors. You will be astonished and captivated by your surroundings. Awaiting you in the morning is a marvelous excursion in a small boat which will take you to one of the most exclusive spots in Liguria: Portofino. From the churchyard of San Giorgio there is the most beautiful panorama of the city and, after a short walk, you arrive at the picturesque fortress of S. Giorgio (also known as Castello Brown), which looks out over the gulf of Tigullio. At lunchtime you will be able to sample the regional cuisine in the friendly restaurants of the area. In the afternoon you will embark in a small boat from Portofino for the bay of S. Fruttuoso, a little fishing village where there is a very interesting abbey to visit, as well as the sixteenth-century tower, the Torre dei Doria. In the morning you will transfer to Genoa where we suggest you visit the celebrated Aquarium. Here there are 59 tanks containing 4 million liters of water which display, in a spectacular manner, the habitats of the Mediterranean and the oceans, of the poles and the tropics; this ensures the health and well-being of more than 500 species of fish, cetaceans, and amphibians. At lunch you will be able to discover the typical flavours of Genoese cuisine, such as Trenette al pesto, in a traditional osteria. In the afternoon you will transfer to San Remo, known as the City of Flowers and famous as the location of the Italian Song Festival, Check-in to your hotel will follow. 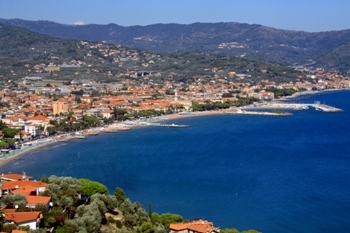 In the morning you will visit the lovely historic centre of San Remo: la Pigna. This area was very close to the heart of Italo Calvino who used it in his novel “Il sentiero dei nidi di ragno”. Even today La Pigna retains much of the feel of a medieval village. The more inquisitive visitor will be able to find a hidden San Remo, a city of winding steps and twisting alleyways, of arches and secluded and peaceful little piazzas. At the very top of the old town is the Sanctuary of the Madonna della Costa, protector of seafarers, offering a spectacular panoramic view. For lunch we’ ll be happy to suggest a typical bistro in the historic center where you will be able to taste some great dishes typical of San Remo cuisine. You are free to spend the afternoon shopping along the renowned Via Matteotti and neighboring streets. In the morning transfer to Cannes, the glamorous home of the famous Film Festival. Your visit will begin in the beautiful Suquet, the historic heart of the city which overlooks the old port, and contains perfectly intact reminders of the past: the Sant’Anna chapel built in the 12th century, the museum of la Castre and the church of Notre-Dame d’Espérance, built in the 17th century. In the afternoon you may like to take advantage of the shopping opportunities offered by the elegant rue d’Antibes or along the legendary Croisette, the promenade that winds among the great hotels and beaches of the city. Afterwards check-in to your hotel, dinner and overnight stay. After breakfast you will embark on a small boat for the Lérins Islands, an oasis of sky and sea, freshness and tranquility. Sainte Marguerite and Saint Honorat will enthrall you with their beautiful natural landscapes. These islands are a marine preservation area, protected by law. On the island of Saint Honorat it is well worth visiting the reconstructed 6th century abbey which is home to a congregation of Cistercian friars. For lunch, allow yourself to be tempted by the typical small restaurants that offer inviting fresh fish and seafood delicacies. Lunches and dinners are to be selected from the menu of the day or the tasting menu proposed by the chef. Beverages and à la carte items are to be paid for on site. The tours suggested in the program are to be considered as free, i.e. without guide.